Indian globe thistle is many branched, annual herb with strongly scented and erect growing up to half meters, Stems are cylindrical with wings. Mostly found in the wet soiled area, leaves are 2–7 cm long, 1–1.5 cm wide, greenish-brown in color. 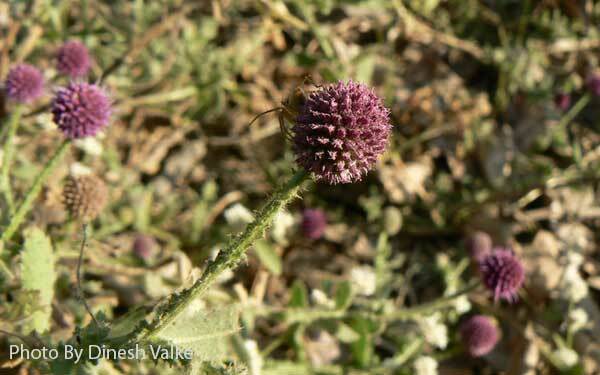 Flowers are globe shaped and purple, flowering is October to January. Whole plant, seeds, flowers, and roots. To treat Skin diseases, Cough, Jaundice disease, increase appetite, enriches the blood, lessens inflammation, luster to eyes, scabies, ringworm of the waist etc. The whole plant dried in sunlight and make powder is used treat urinary problems. Whole plant ground well can apply of skin diseases.